Putting on socks is one of the things that people often take for granted. It’s a part of the daily routine that gets little to no thought as it passes. When you have a disability or trouble with the task, it becomes a part of the day which poses a challenge. Therefore, reviewing TOP 10 best sock aid kits can help you choose the most suitable one for you. What is a Sock Aid? Before searching for the right sock helper for you, it’s important to understand exactly what its purpose is. Simply put, a sock aid is an adaptive device designed to help disabled people who are unable to reach their feet. The device allows them to put their socks on by themselves. Sock aids are sometimes called assistive devices or arthritis aids. Sock aids are generally made from a flexible or semi-flexible material such as plastic and are attached to two handles which can be made from rope or cord. When looking for a sock assist to add to your equipment, keep in mind that they do not come in different sizes. They are able to accommodate feet and socks of all sizes due to their practical design. There are even sock assist options that are specifically designed to work with compression socks and tights. After you have invested in your sock aid, you will need to learn how to use it properly to ensure that you do not face any issues while putting socks on. The process of using one of these devices is fairly simple and straightforward. The first thing you need to do is make sure that you have oriented your sock and aid so that they are aimed in the same direction and will help you fit your sock correctly. The easiest way to be sure that you have oriented correctly, is to put the opening of the sock next to the end of the sock assist attached to the handles. When you are sure that you have oriented the sock correctly, pull it over the sock aid. Slide the sock over the end of the aid without handles. It may be easier to perform this step if you squeeze the aid between your aid while using both hands to pull the sock on. After you have pulled the sock onto the aid, check to make sure that the toe is pulled as tightly as possible against the aid. If the sock is firmly secured on the aid, grab the handles and allow the aid to drop the floor. Make sure you are holding the handles or rope with both hands. Using both hands to hold the handles tightly, put your foot into the sock. Pull the handles and push your foot to ensure that your toes are tight up against the very front of the sock. Now that your foot is in the sock, it’s time to pull up the handles or rope and work the sock onto your foot. You may find that moving your foot while pulling at the same time helps you get your foot into the sock more securely. Keep pulling until you have removed the aid from your sock. If necessary, adjust your sock that it is more comfortable on your foot. Since the sock is on your foot, it should be easier to reach the top of it to pull and adjust as needed. The RMS Deluxe Sock Aid Kit is a super affordable and reliable option to add to your equipment collection. RMS cares about your well-being and provides a lifetime warranty on their sock aids. The aid itself is made with a flexible contoured plastic shell. While the shell is soft, it is strong enough to be of assistance even to those who have weak hand strength, as it makes it easier to slide socks on. The rope handles of this aid can be easily adjusted by simply tying knots to shorten their length as needed. The handles are ergonomic and made with slip-resistant foam pads at the top for optimal ease of use. Each kit comes with the sock aid itself and a helpful instruction sheet. 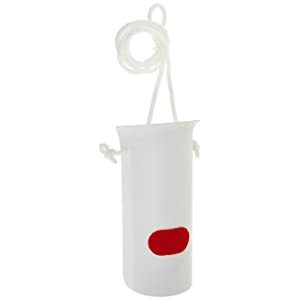 The Medical EZ-TUG Sock Aid is another affordable option to keep in mind. This aid has a contoured design and is made of latex-free flexible plastic. The handles are made of rope and can be adjusted and re-adjusted to suit your needs. The handles are outfitted with foam pads to prevent slipping while you pull your socks on. The Medical EZ-TUG aid is designed to reduce the amount of bending and straining necessary while putting your socks on in order to reduce the risk of sudden injury. This sock aid works for most foot sizes. The Allstar Innovations Sock Slider is a more elaborately designed sock aid. 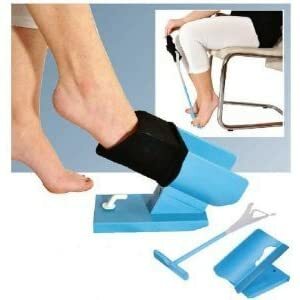 It is made with a plastic cradle that holds and elevates your foot while you put on your sock. To use this aid, you simply put your foot into the cradle, lower the cradle to the ground, and pull the handle. 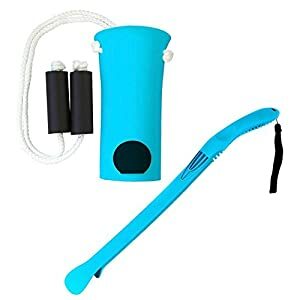 The handle of this aid is created to work like a shoe horn. One of the advantages of the Sock Slider is that it is compact and packs up well for travel and storage. The Sock Slider is very versatile and will work with all types of socks including compression, dress, athletic, and casual. If you’re looking to keep a backup on hand, you may want to invest in the BodyHealt Sock AIDS kit. This kit comes with two identical sock aids, so there is no need to worry about losing or damaging one. This sock aid is high-quality and crafted using a molded plastic frame for durability. BodyHealt knows that not everyone has the same taste, which is why they provide the aid in white, blue, and pink. 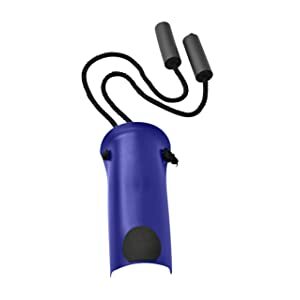 The rope handles are adjustable and designed with foam pieces at the top to prevent slipping. The BodyHealt aid can be used for all types of socks. Keep in mind that this aid is designed for adult use and is too large for use with childrens socks. 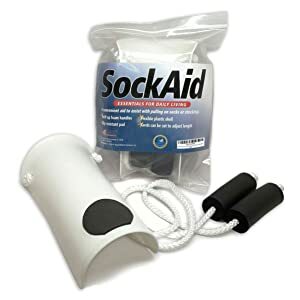 The Kinsman Enterprises Sock Aid Kit includes an aid which is designed with a plastic form to hold and lift your foot off the ground as you put on your sock. After you have placed the sock on the aid and your foot in the plastic form, you will place the form on the ground, and pull the handle up toward you to put your sock on. This aid helps to reduce the amount of bending necessary while putting your socks on to prevent discomfort or injury. You can use the Kinsman Enterprises aid with many types of socks. If you want to use it put on compression socks, be sure that you have the hand strength to pull them on, as it does not provide extra support for this. The Sammons Preston Sock Aid is another practical option made with a continuous rope handle, which is helpful for applying shorter socks without slipping. 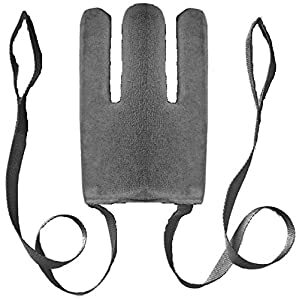 This sock aid includes a no-slip sticky pad which resembles a lint pad and serves the purpose of keeping your foot stable while you’re putting your socks on. 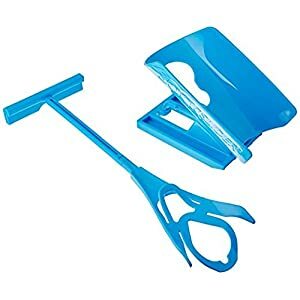 The aid is made from durable and high-quality flexible plastic, and the sticky pad will not show excessive wear and tear even with repeated use. Sammy Preston is a reliable brand that has been used by healthcare professionals for over 50 years. The Vive Sock Assist Device is an affordable option that is simple enough to be used by anyone. This aid is made with a latex-free, contoured, and flexible plastic shell for support and durability. 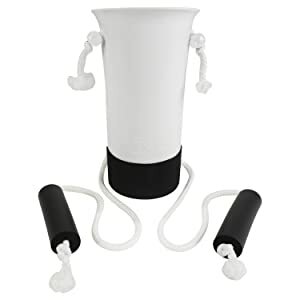 The rope handles can be adjusted by tying knots as necessary, and they are outfitted with foam pieces for extra comfort and to prevent slipping. The Vive sock aid is designed with a slip-resistant cuff which masks the whole bottom of the device to ensure that the sock does not slide off the aid while you’re putting it on. Another option from the reliable brand RMS, this Sock Aid Kit includes a standard sock aid in addition to a Sock or Compression Stocking Remover. This is an excellent help to anyone who has weak hand strength and limited mobility. The sock remover is designed with an easy-grip handle to facilitate people who have limited grasping ability. The sock aid is made from flexible plastic with a non-slip patch to keep your sock in place. 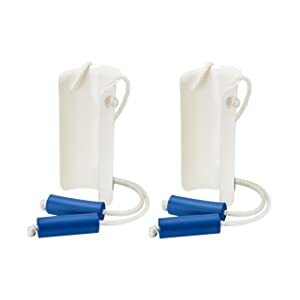 The handles are made from adjustable rope and include foam pieces for comfort and slip prevention. The Blue Jay Sock Aid is yet another simple and practical option. The aid is designed in a deep blue color for aesthetic pleasure. The molded plastic frame of the aid bends with the contours of your foot and heel for comfort and ease of use. The aid has large foam handles for comfort and slip prevention attached to the main adjustable rope handles. 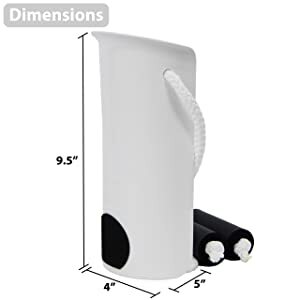 This aid will work with most foot sizes including wide, but is not meant for use with compression stockings. If you choose to invest in the Vakly Sock Aid, you will be getting high quality for a good value. This aid is made with a strong but flexible core to help you pull your socks on easily. An added bonus of this aid is that it completely covered in terry cloth to prevent your socks from slipping while you’re putting them on. The handles of this aid are designed with loops at the top for a better grip for those with limited hand function. Investing in a sock aid device can make a big difference in one of the most basic parts of the daily dressing process. Rather than struggling to put socks on and end up in pain, use a sock aid and find yourself saving time and stress.